We’re back. And in this lesson we’re going to focus on a simple (but potentially confusing) topic known as enharmonic notes, and something called note spelling. Our goal is to head off any confusion right at the beginning, and get a crystal clear overview of the subject. Last lesson, we learned that accidentals are symbols that raise or lower a note by one or more half-steps. As we explored this topic, we found out that this leads to a situation where we have more than one possible name for each note on the keyboard, like we saw with the black notes. An enharmonic is simply an alternate name for the same note. For instance, C# is the enharmonic of Db (and vice versa). One note, multiple names. That’s the concept in a nutshell. It’s always important to choose the best enharmonic of a note for each musical situation, and this is called “spelling” notes. Depending on the situation, C# might be the more appropriate or correct choice to name a note, or sometimes Db would be the better choice. 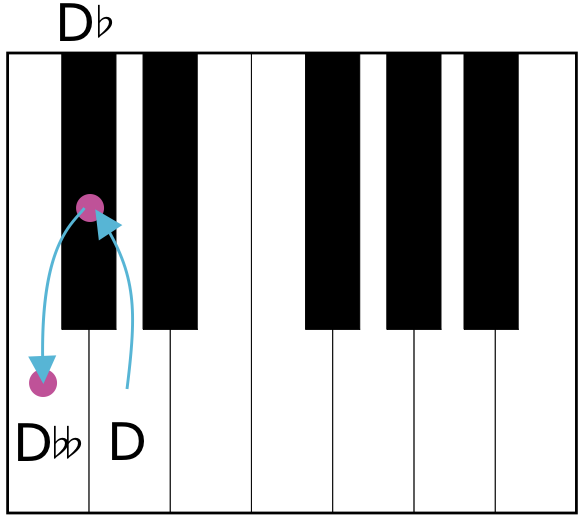 Both of these notes refer to the same exact note on a piano, but choosing the best name, or enharmonic, makes the music easier to read and understand. Choosing the wrong enharmonic can make things very confusing, and makes life harder for a musician who is trying to read notes on the fly. He/she will probably have to stop for a moment when they reach the incorrectly spelled note before they realize what the intended note was. Now, without any musical context, one enharmonic is no better than another. Only when it comes to actual music, meaning a melody or composition in a certain key for example, does the choice of spelling the notes really matter. But before we can make the right choice of spelling, we need to know all of our choices! Once we know all the possible spellings, we will then be able to look at each particular situation and choose the best or most appropriate enharmonic. In the previous section, we caught just a small glimpse of the confusion of having more than one name for a note, when we learned two enharmonics for each black key. Now, we’re going to go a bit deeper and look at all the possible names for each note. Here’s an example that will illustrate how all this works. Imagine you meet a guy named Bob. Normally, that’s how he likes people to refer to him, as Bob. But at work in his attorney’s office, he’s known as Robert. When he’s out with his gangster buddies, they call him by his nickname, Fast Trigger. He also has an internet username, Bobby1234. And his kids call him Daddy. All in all, we can say that Bob has 5 types of names; a regular name (Bob), a work name (Robert), a nickname (Fast Trigger), a username (Bobby1234), and a family name (Daddy). 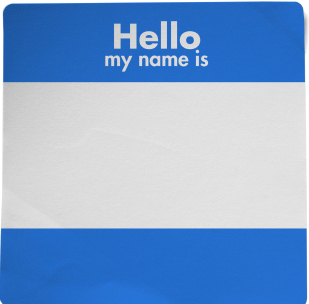 Now, not every person necessarily has a unique name for work, plus a nickname, plus an internet name, etc. like Bob does, but they might have some, all, or none of these alternate name types. This is the equivalent of a home name, a work name, a nickname, etc. Not every note necessarily has all of these name types; these are just all the possible types of names. In fact, all the notes except for Ab/G# have just 3 possible names (Ab/G# just has 2). Okay, so let’s jump right in, and take a look at some specific notes and find all the possible names for them. Once we get the hang of it, you’ll see how easy it actually is. Let’s take the note C. C itself is obviously the unaltered name. It is just called C, without any accidentals. In order to find the other names, we simply have to ask ourselves, can we call C by a different letter-name, and then adjust using accidentals? Let’s see: We could call the note C “D”, but then we need to lower it by two half-steps to make it into a C note. 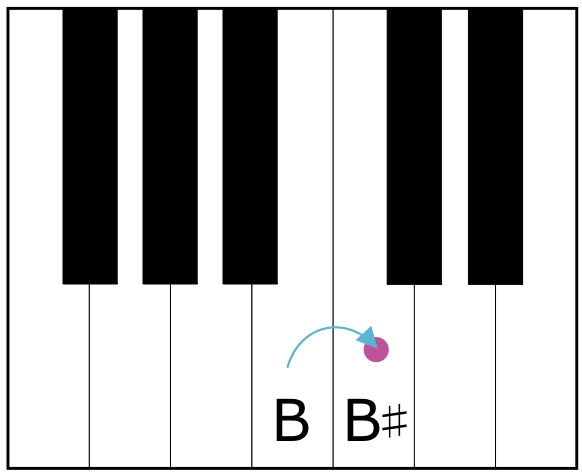 D double flat (Dbb) is therefore a valid alternative name for C, because C is a whole-step below D. This means that the note C does in fact have a double flat name. What about B, will that work? Well, what do we have to do to the note B to make it into C? Raise it by a half-step, B#. So yes, B♯ is another valid name for C, because C is a half-step higher than B. B♯ is C’s sharp name. So far we have derived three possible names for the note we normally call C: C, Dbb, and B#. Can we go even farther, and call the note C by the letter-name “A”? Well, in order to do that, we’d have to raise A three times, or A triple sharp, and there’s no such thing as triple sharps! So no, that doesn’t work. Similarly, C would be E quadruple flat! And if we continue to go in either direction, it would get even worse (C would be G quintuple flat, and so on). So clearly, no other names are going to work besides the three we already mentioned, C, Dbb, and B♯. All together, C has three names: an unaltered name (C), a sharp name (B♯), and a double flat name (Dbb). It doesn’t have a flat name or a double sharp name. Let’s do one more example to get the hang of it. We’ll move up a half-step, and focus on the black key just to the right of C. We already learned two names for this note, C# and Db. In order to get more enharmonics, we need to use the same approach as before – we have to find out whether we can use any other letter-names for this note. Let’s try B. What do we have to do to B to adjust it to the note C#? One glance at the keyboard tells us that we would have to raise it twice, and call it B double sharp. So yes, this does work; B double sharp is another enharmonic for C#/Db. The letter name E, though, will not work, because it would be E triple flat, which does not exist. The most we can have is double flats and double sharps. Similarly, using the letter name A would result in A quadruple sharp, which also doesn’t exist. All together, Db has 3 name types: a flat name (Db), a sharp name (C#), and a double sharp name (Bx). It doesn’t have an unaltered name or a double flat name. 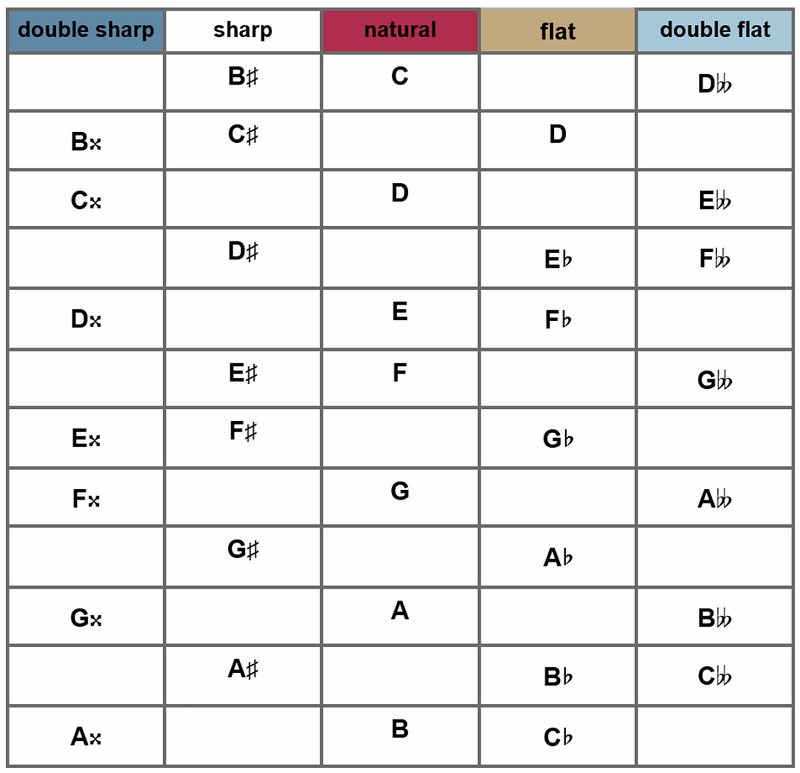 Below is a comprehensive chart of all the possible enharmonics for every note. Starting from the top, the chart shows the names for every single note, from C up to B. Each row across represents all the possible name for a certain note, from its double sharp name through its double flat name, and everything in between. If a “cell” is blank, this just means that there is no such name type for that particular note. Now that you know how to figure these out for yourself, take a look at the chart and see if it all makes sense to you. You can also use it as a quick reference whenever you need one. 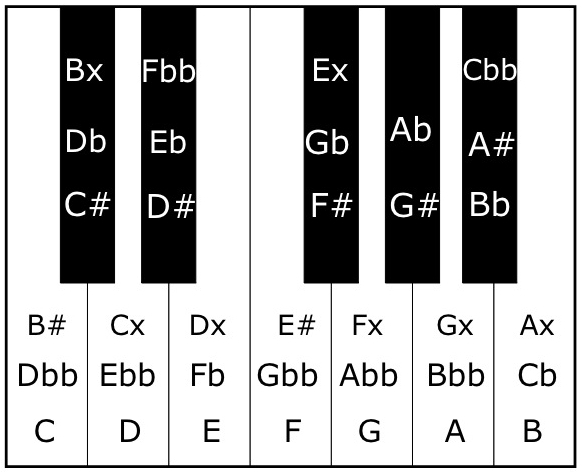 The chart shows us that each note ends up with 3 possible enharmonics, with the exception of G#/Ab which only has two possibilities. At this point, we’ve learned how to find every possible enharmonic for every note. This means we know all our choices, when it comes to spelling notes (choosing the most appropriate enharmonic for the situation). In order to actually choose the best spelling, we still need more background information first, including learning our major scales, and a few other topics that we’re going to cover. We will see that choosing the best enharmonic is very simple matter. Actually, it’s even easier than choosing paper vs. plastic; there is usually only one good choice that makes any sense. We started out in the beginning of this section learning the very basics of the piano keyboard, and by this point, we know all the possible names for every music note. We have come a long way! Give yourself a pat on the back, or otherwise if that’s very uncomfortable for you then have someone else do it for you. The next section of the website will cover the musical staff, and the foundation for reading music. Check it out, or feel free to explore any other area that you’re interested in. Hope to see you there! What is an enharmonic note? What is the enharmonic of G sharp? Can an enharmonic contain double flats or double sharps? Can an enharmonic contain triple sharps or triples flats? How many different spellings, or enharmonics, does the note C have? Is there such thing as F flat? Does the note A have a flat name? How many different possible spellings do most notes have?